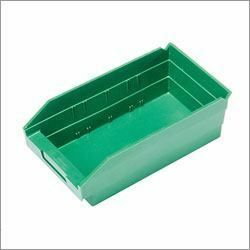 These high density plastic shelf bins provide both a durable and economical solution to storage problems. Features: Made from polypropylene/polyethylene Built in label holder Wide open hopper front for easy access Built in rear hanglock allowing for tilting of the bins for complete access of contents Reinforced edges for extra strength Waterproof and resistant to oil and grease Impervious to most chemicals Rear "V" lock allows bins to hang from a Shelf Unit with in use Optional bin cups, dividers and labels available separately (see related items) Overall Dimensions: 4" H x 6 5/8" W x 11 5/8" D Available in Blue, Red, Green We recently moved in case you did not know. When we moved we upgraded a lot of our shelving units and bins. We are selling our excess bins that we no longer need. These are USED, but not in bad condition. Some might be a little scratched up, a little dusty, but these are still perferctly good. These are the exact same bins we used, still use, to store jewelry in, bags, tools, almost everything we do involves the use of these types of bins. Great to have in the shop to help keep stuff organized.